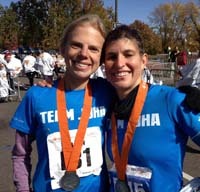 Johanna Olson and Angenie McCleary celebrate finishing the Oct. 7 Twin Cities Marathon in St. Paul, Minn.
Johanna Olson, 33, the pride of Wadena, Minn., was running the 31st annual Medtronic Twin Cities Marathon about 12 months after her third surgery for brain cancer. The last year has been difficult for her as the brain tumor has grown and limited the things she can do. Ketchum’s Angenie McCleary, 35, was running the 26.2-mile event from Minneapolis to St. Paul, Minn. a week after dislocating her elbow in a mountain bike spill. She wore a hard cast from her hand past her bicep, which strained her shoulder and neck. The Oct. 7 footrace was a different kind of marathon for Olson and McCleary, good friends who met after Olson moved to Ketchum in 2003. McCleary has run 11 marathons and is accustomed to turning in times like 2.54:00. Olson finished the U.S. Olympic Marathon trials in 2004 and 2008 and has done eight marathons, including the Twin Cities Marathon four times. But this year, in St. Paul, they ran together for the final 15 miles and finished together in the field of 8,781 runners, clocked in a little over five hours. Olson’s time was 5.09:54 and McCleary’s 5.20:10—about 12 minutes a mile—although they broke the tape together. They weren’t alone at the jam-packed race start, in cold 28 degree temperatures with a brisk wind. There were at least 25 other supporters of Olson’s quest to finish the marathon. Joining Olson were her parents Jane Bagstad and Terry Olson, who was her running coach in high school, and her cousin and a friend. Her grandparents were there among 15 to 20 spectators and rooters. McCleary ran the first 11 miles in 59 minutes at a 7:25 pace with her brother George. But she felt uncomfortable at that pace with the weight of arm cast. She stopped and waited until the Olson contingent caught up, and then jogged and walked the rest of the race with her friend and the group. Said McCleary, “We spent most of the last 15 miles walking and talking—it was such a social event. It was my slowest marathon time, but it was great, really fun, and so nice to see Johanna so healthy and happy.